There are no good haunted houses around anymore; I’m thinking of old mansions, like Miss Havisham’s, with moldering curtains at the window, moth-eaten furniture, and old newspapers and pictures from another era strewn over the floors. There are, unfortunately, foreclosed homes with Sheriff’s Sale signs on the door with unclaimed newspapers on the stoop, but they aren’t so much abandoned or deserted as taken hostage. 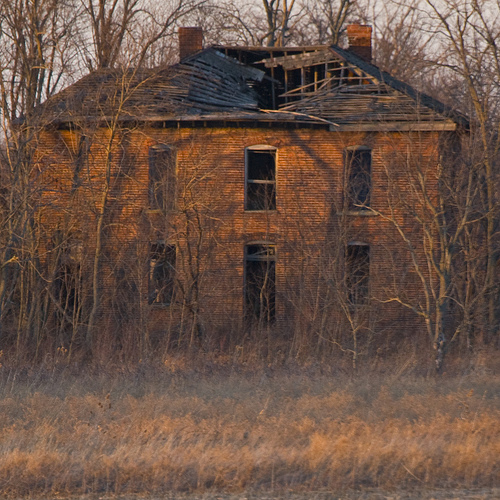 I’m thinking of an abandoned house of my childhood, the Dayton House…an old, decaying house at the end of a pebbled drive, nearly out of sight in a brand new subdivision of spanking new houses. Sort of like the once abandoned house the Bailey’s refurbished in “It’s a Wonderful Life.” A mansion that once must have housed a family who liked velvet drapes and richly upholstered chairs, and read newspapers from all over the county. In the sparkling, clean, neutered world of the fifties, the Dayton house was like a magnet for the neighborhood kids. For a few years we were content to just peer through the dirty and broken windows and make up stories about we saw. Maddy insisted that she saw a dark shadow, like a woman in black, darting up the steps. Heidi speculated that the family was murdered in their beds many years ago so no one would buy the house. Nell winced at the sight of mice scampering in and out of a hole in the couch. Older, we would push and tug at the side door until it creaked upon. Cautiously we would creep around the house, one eye on the door so we could make a quick escape if the lady in black or the murderers or the mice made sudden appearances. I was most interested in the newspapers. What was the family reading in the days before they left their home, never again to return? Were there clues here about what prompted their exit? The smell of mildew and dust perfumed the air. The wallpaper collected in colorful streamers on the floor. It was beyond exciting. We laughed nervously and cautioned one another about staying close together and not leaving fingerprints on anything. We were the new Nancy Drews; we were adventurers; we were no longer mere suburban middle class kids. The last time we explored the Dayton House, though, someone saw us and called the police. I don’t know how they found out who we were, but one of the parents called mine and our Dayton House explorations were done. Forever. Shortly thereafter, the house was demolished and ticky tacky suburban homes took its place.